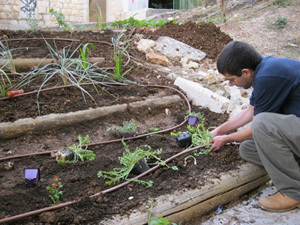 This past November, in the heat of a day’s work in the community garden adjacent to the new WAC (Ma’an) office in Haifa, a curious neighbor asked us what the connection is between a worker’s organization and a community garden. At the time, there were working in the garden volunteers accompanied by a professional gardener. They sawed electric poles, carried earth and compost with zest, and planted vegetables and herbs. In addition, on the roof of the adjoining bomb shelter, a group of young women gathered around women basket weavers from the basket weaving project of Sindyanna of the Galilee in Kfar Manda, who donated that day’s activity to the garden project. Next to them gathered the children of neighbors and volunteers, Jews and Arabs, who were busy preparing dough and pitah bread on a Sa’g, under the guidance of a volunteer from the Youth organization of WAC. Others decorated a portion of the roof of the bomb shelter with a ring of printed artwork. Also some truck drivers were on site—some to see what was going on and show their support, and some to receive legal aid. All of this was the reason that even before this neighbor received an answer to his question, he was drawn into the project with enthusiasm and joined in to work. The event offered WAC and the many volunteers who came ample opportunity to make new connections.